In order to support Downtown Reading and the city businesses the Reading Parking Authority, for the first time, is offering a great parking incentive! From December 21, 2018 (8 am) until December 26, 2018 (8 am), there will be no charge for those who park at METERS or KIOSKS to encourage patrons to visit Downtown Reading to see what the City of Reading has to offer this holiday season and beyond. 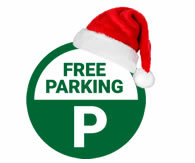 From December 24, 2018 (4 pm) until December 26, 2018 (5 am), parking in all our GARAGES will be free. The Reading Parking Authority is offering this so that family and friends can spend time with each other over the holiday without having to worry about finding or paying for parking. In order to receive free parking anyone who parks in the garage must exit the garage by 5 am on December 26, 2018; exiting the garage by the time noted is paramount so that those who pay to park in a garage relative to their occupation are able to park when they return to work. Anyone who stays beyond the allotted time will have to pay for the duration of time he or she was parked in the garage.